In the winter of 1917, nineteen-year-old Martha Lessen saddles her horses and heads for a remote county in eastern Oregon, looking for work gentling wild horses. She chances on a rancher, George Bliss, who is willing to hire her on. Many of his regular hands are off fighting the war, and he glimpses, beneath her showy rodeo garb, a shy but strong-willed girl with a serious knowledge of horses. So begins the irresistible tale of a young but determined woman trying to make a go of it in a man's world. Over the course of several long, hard winter months, many of the townsfolk witness Martha talking in low, sweet tones to horses believed beyond repair getting miraculous, almost immediate results. It's with this gift that she earns their respect, and a chance to make herself a home. "Martha had set out from Pendleton meaning to live a footloose cowboy life and see the places she'd read about in Western romances-she hadn't come down to Elwha County intending to stay". What does a "footloose cowboy life" mean to Martha? Does she find it? What are Martha's methods for breaking horses? How do they differ from most other people? What challenges does Martha face as a female broncobuster and how does she overcome them? Why do so many characters take notice of Martha's outfit, dressing "like she's headed off to a rodeo"? Many of the characters in the novel come across as very lonely. For example, "Dorothy had been starving for female company, for any company really, so long as it wasn't a child, but she didn't say so". What makes Elwha County such a lonely place? When Martha attends the Christmas dance at Bingham Odd Fellows Hall, she "stood at the edge of their crowd in an agony of loneliness". How is Martha's loneliness different from Dorothy's? Kent Haruf said of Molly Gloss and The Hearts of Horses: "She's given us…a great deal of lore about the gentling of horses-a gentling that suggests both a practical fact and an enduring metaphor." Explore the gentling of horses as a metaphor. What's the secret to Martha's horse whispering? How does Martha's gift with horses reflect her character? Explore how the circle ride, too, might be symbolic of something greater. Who is on the ride and how do the horses and their owners become a part of Martha's life? The novel takes place during the winter of 1917-1918, just after the U.S. entered World War I. In what different ways does the war affect characters' lives? How has it changed the way the land is used? Because of the war, many of the German families in Elwha County are mistreated, there are grand displays of patriotism, and many sacrifices are made for the greater good. How are these consequences of war similar to or different from those which occurred during wars the U.S. has fought in since WWI? Do you see reflections of the current war in Iraq? Martha judges people by how they treat their horses. The Thiedes notice that she had "evidently made up her mind that people who treated horses decently must be decent people". How do you form your opinion of people? What is your moral compass? While riding with Henry Frazer, Martha tells him what she's heard of the harsh treatment of horses in the war. When Henry makes a comment about Will Wright enlisting, Martha "thought he might be making a point about the men, whose suffering ought to be more important to her than the horses. She wondered if Henry even believed her, that horses had their horse friends and that they might become homesick and lonesome among strangers". Why does Martha think about the horses first and humans second? In times of war, do you think it's justified to sacrifice the comfort and safety of animals? To what extent? Martha is responsible for getting Al Logerwell fired for beating horses. What are the repercussions of Martha's actions? Later, she repeats a comment she heard from the Woodruff sisters when she says, "Well, there are plenty of men who will beat a horse. But they'd just better not do it in front of me is all". What is the significance of this statement? Why does Louise Bliss avoid all news of the war? Why does the library she attempts to open through the Elwha Valley Literary Society become such a sensitive issue? Martha and Henry's marriage feels inevitable long before Martha realizes the path she's on. What does Martha tell Henry she wants out of a marriage and how is he able to give these things to her? What makes Henry different from most men Martha has known? Shortly after her marriage to Henry, Martha realizes that "loving someone meant living every moment with the knowledge he might die-die in a horrible way-and leave you alone". What events in the novel led her to this conclusion? How else did these events change her? Have you ever had a similar realization in your own life? 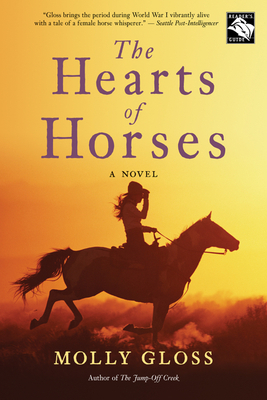 How is this book about the "hearts of horses"? Which horses are characters and what are their roles? What else might the title be referring to? In the last paragraph of the book, Martha tells her granddaughter, "I guess we brought about the end of our cowboy dreams ourselves". What does she mean by this? Do you agree with her?